After more than half of a century, the gift of a $700,000 building to Virginia Union University in 1941 has proven to be one of the most powerful gifts ever given to a school. It was recently discovered (March 2004*) that the original carillon from the tower in the Belgian Friendship Pavilion, 1939-40 New York World’s Fair, is located in the Hoover Tower at Hoover Institution, Stanford University, Palo Alto, California. Research found that while Richmond local newspaper articles at the time acknowledged the placement of the bells, a carillon, in Palo Alto, no mention was made of Stanford University as the exact location. The finding is further significant because neither of the archivists at Stanford nor at the Hoover Presidential Library in Iowa have any record of Virginia Union University, Richmond, Virginia as the location of the Belgian Building in their archives. The Belgian Friendship Pavilion was designed by the world renowned Belgium architect Henry Van de Velde (1863-1957) and is listed as a National Treasure and a Virginia Historical site. It was conceived to be re-built in Europe. Van de Velde was commissioned to design the building in New York after his Belgium Pavilion was seen at the French International Exhibit in Paris in 1937, the last such fair in Europe before the World War II. Since the Belgian Friendship Pavilion, laid out in four sections, could not be returned to Nazi occupied Belgium, it was given to Virginia Union University as a gift from the government of Belgium. Virginia Union was one of about twenty-seven (27) universities interested in obtaining the prized exhibit. It received the gift because of its location and its mission. Virginia Union and The Belgian American Education Foundation paid for dismantling and transporting the building and carillon to their new sites. Virginia Union’s cost for the building, that included the tower (called belfry), was $500,000, raised largely through the work and influence of its first African American president, the late Dr. John Malcus Ellison (1889-1979), and some of his very generous supporters. President Hoover (1874-1964) raised the needed $16,750 for the Stanford library bells for its belfry. The Belgian American Educational Foundation (BAEF) provided added assistance. In both instances there were to be on-going costs for renovations and repairs. Leon Ploegaerts, Professor Emeritus, Ottawa University and co-author of L’Oeuvre architecturale de Henry Van de Velde, is an expert on the works of the architect. His references to Virginia Union University’s Belgian Building, with color plates, are documented on pp. 211-213 and 412-414. (Ploegaerts, Leon and Puttemans, Pierre, Bruxelles-Quebec, Vokaer-Les Presses Universitaires de l’Universite de Laval, 1987). Unquestionably the Belgium gift was an outstanding gesture of hope, peace and brotherhood for humankind. 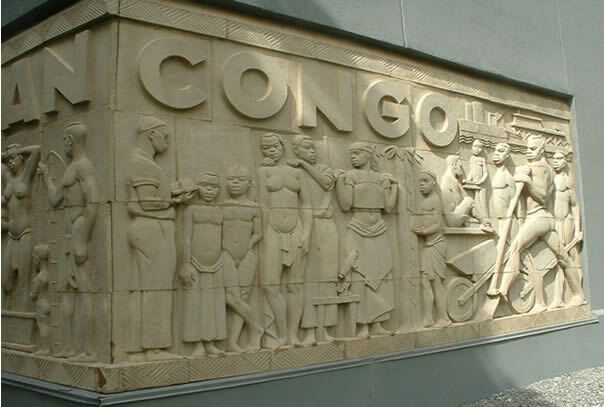 Ploegaerts also related that Oscar Jespers and Henry Puvrez sculpted the ceramic sandstone bas-relief on the side of the building. 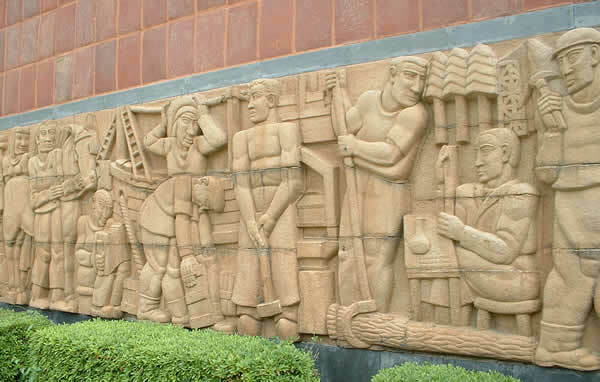 According to a document called “Plan of the Belgian Pavilion (p. 18),” the sculpture “evokes Belgians at Work and is believed to be the largest bas-relief executed in ceramic since the celebrated frieze “Archers” of the Palace of Darius I at Suse (Persia), dating from about 500 B.C.” (Undated paper from Belgian Friendship Pavilion description, New York World’s Fair 1939-1940, located at the Virginia Department of Historic Resources) There is another bas-relief sculpted by famed Belgian Sculptor, Arthur Dupagne. His masterpiece is located on the inner courtyard at the base of the majestic Belgian Friendship Tower illustrated below. History must be inclusive if it is to be correct. It is proposed that the information regarding the interconnectedness of Virginia Union with Stanford University and the Hoover Presidential Library be brought to the attention of the public in general, to historians, and all other entities of the three institutions. Virginia Union University, the first historical African American college, opened in the fall of 1865, deserves to “take its place in the history books” and to receive the added support it deserves as it continues to educate many students, whether they be of African descent or not. Furthermore the work of Dr. John Malcus Ellison should be “etched” into the historical records for time immemorial. By the same token students at Stanford deserve to know more about the connection it has with Virginia Union University as well as President Hoover’s relationship with Belgium and his gifts to Stanford. It is proposed that new bells, clocked to chime the time, like those heard throughout Belgium (and at Stanford), be obtained for the Virginia Union University belfry tower and that Virginia Union University proceed with any and all preservation efforts that will maintain the integrity of the Van de Velde building. “Bells for Peace” would complete the Tower’s belfry and would be symbolic of all peoples’ common concern for a peaceful and non-violent future. In the past so much of the rich history of African Americans has been under-reported, discounted or given little relevancy. Yet, the humanitarian ideals and principles of racial harmony, friendship and brotherhood upon which many people stand are timeless. As we move forward through a global society, the interconnectedness of mankind becomes even more relevant and evident as a result of telecommunications, travel, and man’s search for new information. We owe it to history to continuously disseminate those truths that will elevate the goals of peace and harmony. The implications of refocusing attention on the Belgian Friendship Building are immeasurable, too numerous to imagine. Through the concerted efforts of all peoples, a new beginning of stellar achievement and societal contributions become obtainable realities. 1.The Belgian Friendship Building Sponsoring Committee was chaired by Mrs. Franklin D. Roosevelt, His Excellency Count Van Der Straten-Ponthoz , Belgian Ambassador in the United States, His Excellency James Hubert Price, Governor of Virginia, Harold J. Manson, Brooklyn Representative, S.E. Hening, Treasurer, American Baptist Home Mission Society in New York. 2. According to Dr. Gordon B. Hancock (deceased dean at Virginia Union University), the dream for bringing the Belgian Building to the campus of Virginia Union University originated with J. Burweil Hening, a student at a neighboring white institution, who told his father that Union’s basketball team needed a gymnasium in which to practice. Dr. Hancock further explained that the student was impressed by the athleticism of the team. His father, who was executive in the American Baptist Home Mission Society, headquartered in New York City, was influential in the building coming to the campus of Virginia Union. (News Leader 1941). 3. Dr. William John Clark was president of Virginia Union University at the time negotiations for the building began. He retired due to ill health and Dr. Ellison, his vice-president was selected president and ultimately completed the project. 4. Dr. Hugo van Kuyck was the renowned Belgian architect who supervised the reconstruction of the Van de Velde Belgian Building on the campus of Virginia Union University from its original construction in Belgium for the New York World’s Fair (Richmond Times Dispatch 6-29-41). 4. The tower was named Vann Memorial Tower after Robert L. Vann, publisher of the Pittsburg Courier and former assistant United States attorney general. Mr. Vann, an African American had received part of his training at Virginia Union University (Pittsburgh Courier, 3-14-42). 6. The Civil Engineer for the Richmond building was Armand Vermaelen (Pittsburgh Courier, 8-16-41). 7. *Alan W. Nelson (Trenton, New Jersey) made the connection between former President Herbert Hoover to Stanford University’s Bell Tower by “surfing the web” in March 2004, after having been clued by his sister, E. Dianne Nelson Watkins. He is a nephew of the late Dr. and Mrs. John M. Ellison (Elizabeth Balfour). 8. E. Dianne Nelson Watkins is a niece of the late Dr. and Mrs. John M. Ellison, and was reared on the campus of Virginia Union University. She is also an alumnus. Interesting, Dianne was a fellow in the School of Education Executive Leadership Institute (SELI) at Stanford in June 2003, heard the bells chime, but had no idea of her relationship to them.